Tarchin Hearn, with his companion Mary Jenkins, have devoted decades of their lives to help establish the Wangapeka as a centre filled with people doing the deep work of unfolding. Tarchin and Mary are both elders of the Wangapeka, and Tarchin gives retreats (pretty much) yearly at the centre. This biography is from Tarchin’s website Green Dharma Treasury which has a lot of teaching articles and meditation instructions. Tarchin Hearn was born March 4, 1949 in Romford England. After World War II, there was a shortage of housing, so for the first two and a half years of his life he lived in an abandoned bus in the middle of a field with his parents, John and Margaret (Margaret later changed her name to Sybil) and with an aunt and uncle. At the age of three, the Hearn family, now augmented with another son/brother (Stephen), immigrated to Canada and settled in the vicinity of Toronto where a sister (Kate) completed the family dynamic. Eric, as he was known in those days, attended school in Don Mills. Throughout his youth, he was blessed with a rich array of learning experiences that often took him adventuring away from his family. These activities involved immersion in music, Saturday Morning Club at the Royal Ontario Museum, sailing and water activities, lots of time roaming in ravines and woods, quite early money making responsibilities, athletics and competitive snow skiing. In 1967 he began studies at Simon Fraser University in Vancouver. In the late 60s, universities were hot beds of political and social activism and, like many others of his flower-power Vietnam war-protest generation, the young Tarchin participated in mass rallies and drifted through a number of faculties; in his case, from biology, to geography, to psychology and social sciences. Eventually he abandoned university with the idea of seeking a more meaningful education through travel and experiencing other cultures throughout the world. At the age of 20, in Toronto, he very briefly met the Bhikkhu Ananda Bodhi but then left Canada to hitch-hike, on his own, across North Africa and through the Middle East to India, where, after nine months of roaming on a proverbial shoe string, he developed a serious case of hepatitis coupled with various strains of amoebic dysentery. 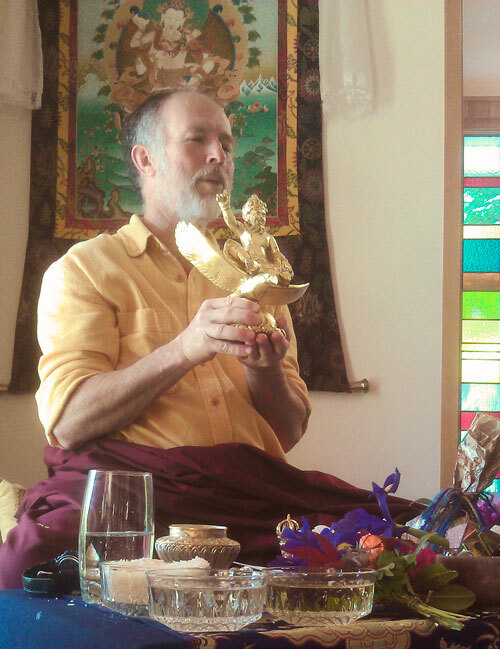 After returning to Canada and regaining his health, he reconnected with Ananda Bodhi and with the excitement of feeling he had discovered something fundamentally meaningful to do with his life. For much of the next 7 years, he travelled all over the world, often on ocean-going cargo freighters, studying and retreating with the ‘Bhikkhu’ who later re-ordained and has been known since as Namgyal Rinpoché. Under Rinpoché’s guidance, Tarchin, along with other dharma students, explored the Theravadin, Mahayana and Vajrayana schools of Buddhism, as well as Christian Mysticism, psychology and psychotherapy, various types of body awareness therapy, history, art and natural science. At the age of 24 he received the novice ordination in the Karma Kagyu tradition of Tibetan Buddhism from Kalu Rinpoché who was his second main teacher and was given the ordination name Karma Tsultrim Tharchin. Karma means activity. Tsultrim means ‘wholesome relating’. Tharchin, pronounced Tarchin, (the ‘h’ is silent) means, ‘vast like the sky’, and ‘gone to the limits of realization’. At 27 he received the full Gelong/Bhikkhu ordination from H.H. the 16th Gyalwa Karmapa. Throughout these years he continued to travel and study with Namgyal Rinpoché. In addition to Namgyal who was his ‘Root Guru’, Tarchin studied with illuminating teachers such as Kalu Rinpoché, H.H. The 16th Karmapa, and U. Thila Wunta Sayadaw (Namgyal Rinpoché’s original Burmese teacher). He also received teachings and transmissions from H.H. The Dalai Lama, H.H. Sakya Trizin, H.E. Chobje Rinpoché, Ling Rinpoché, Trichang Rinpoché, Kanjur Rinpoché, Karma Thinley Rinpoché, Dilgo Khyentse Rinpoché, Namkhai Norbu Rinpoché and Thich Nhat Hanh. Through their writings, Tarthang Tulku, Krishnamurti, David Bohm and Lynn Margulis were other teachers who greatly influenced him. 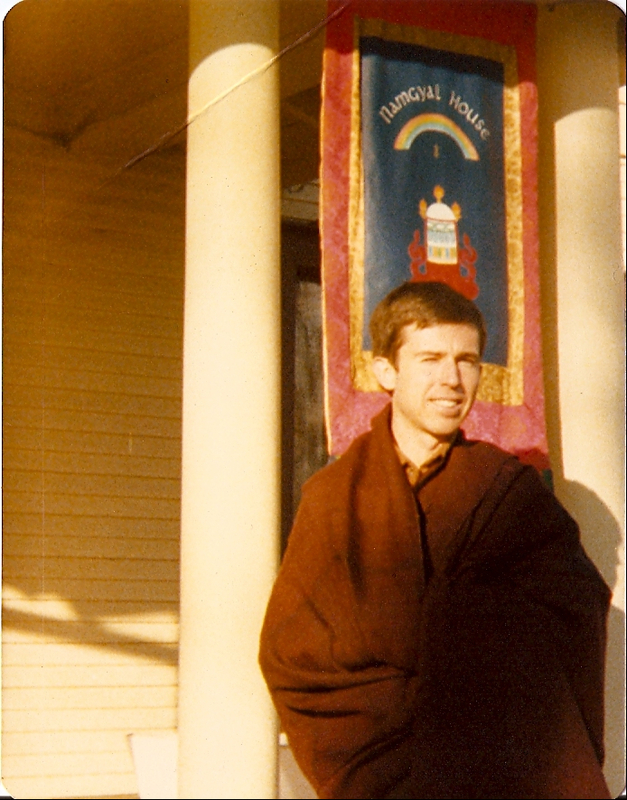 In 1977, Tarchin was sent by Namgyal Rinpoché to be resident teacher in Ottawa, Canada. There, he helped found a dharma group named Crystal Staff. Since that time he has taught and led retreats in many countries and helped establish a number of centers for study and practice. In 1980, he was invited to teach in New Zealand. He came again in 1981 and 1982 when, at Rinpoché’s suggestion, he began the process of establishing residency there. Since then, he has been a guiding teacher and, at times, resident teacher for The Wangapeka Study and Retreat Centre near Nelson, where over the years he has led many long retreats and training programs. After 12 years of ordination, Tarchin was finding himself questioning the relevancy of living as a Buddhist monk, while surrounded by lay people and the values of a western secular society. He sensed an increasing dissonance, between the teaching he was giving, which encouraged wide open enquiry, compassion and respect for all forms of life along with a deep appreciation for the interconnectedness of all phenomena, while simultaneously, he was publically representing what was beginning to feel, at times, like a slightly medieval, patriarchal, hierarchically controlled religious tradition that, in many ways, was out of step with modern life experience in New Zealand. On the full moon of May 5, 1985, after months of deep pondering and a considerable amount of inner struggle, in a public ceremony at Wangapeka, he formally disrobed. Writer, poet, artist, traveller and inspiring teacher, Tarchin has at times described himself as a ‘yogi of the natural world’. He has a great passion for blending the insights and understandings of science and ecology with buddhadharma, and in particular, the teachings of Mahamudra and Dzogchen. Often using microscopes and magnifying glasses to enrich silent meditation retreats, his teaching sometimes looks more like deep ecology than classical Buddhism. Widely regarded as an lama and a naljorpa (yogi) in the flow of dharma exploration flowering out from the Mahamudra tradition presented by Namgyal Rinpoché, and authorised to bestow empowerments in that tradition, Tarchin, nevertheless, is continuously exploring ways to present the teaching (Dharma) so that it is immediately relevant and useful to the people he meets, in the circumstances in which they are living. 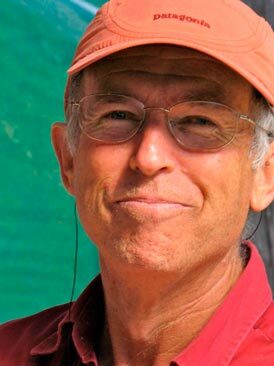 Tarchin’s emphasis on contemplative enquiry integrating the four Jungian functions (sensing, intuition, intellect and feeling), all thoroughly suffused with lovingkindness and compassion, speaks to people from diverse educational backgrounds and life interests and as such, is non-sectarian and profoundly inclusive in nature and application. Weaving together humour and seriousness, eclectic experimentation and classical tradition, his life and teaching has inspired a broad range of people, from those who are new to a spiritual life of compassionate action and meditative enquiry, all the way through to people who are themselves competent teachers of various particular traditions. For thirty years Tarchin continuously travelled the world, teaching, retreating and working with beings. 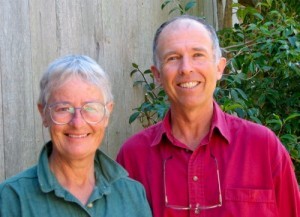 More recently he has begun decreasing the amount of travel and, with his partner Mary Jenkins, is spending more time at Orgyen Hermitage, their land in NZ. 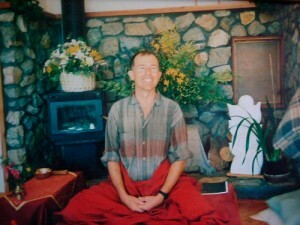 Though still teaching and leading retreats, Tarchin’s interests have extended to studies in molecular biology, neuroscience, shakuhachi flute making and playing, gardening and to deepening his apprenticeship with the soil and the living earth; as he says, tongue in cheek, “living the path of a dharma farmer”. ‘Living Explorations’ These courses were conceived as a way of living a life of dharma exploration and exploring the dharmas of living. They took place mostly in the 1980s and early 90s. Small groups of up to 16 would spend about two months travelling and exploring in remote parts of the world. Teaching and meditation practice often took place outside; in deserts, forests, tropical jungles, mountain meadows, tidal zones and coral islands; wherever the group found themselves. The living world was their temple, classroom and laboratory. It was on these journeys that Tarchin began to integrate ecology studies with traditional buddhadharma. Living Exploration trips went three times into the outback of Australia, to the Chatham Islands off the east coast of New Zealand, Fiji, Borneo/Sabah/Sarawak, Alaska/Yukon, Central America, Zimbabwe and Namibia, Nepal, Myanmar; as well as shorter explorations to many other wilderness environments. 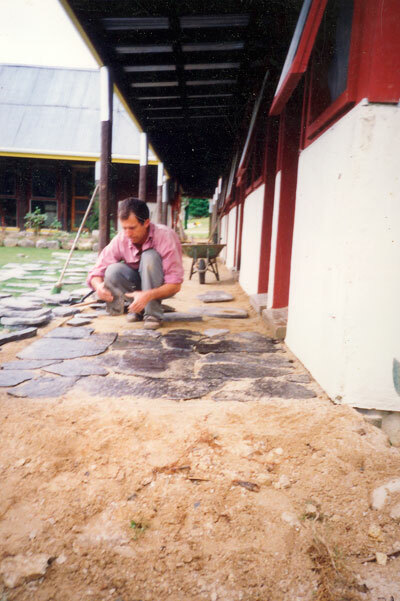 He created and initially taught the “Garden of Mindfulness” an annual retreat for families at Wangapeka. Between 1980 and 2007 at The Wangapeka Study and Retreat Centre, Tarchin led annual retreats of approximately three month durations.